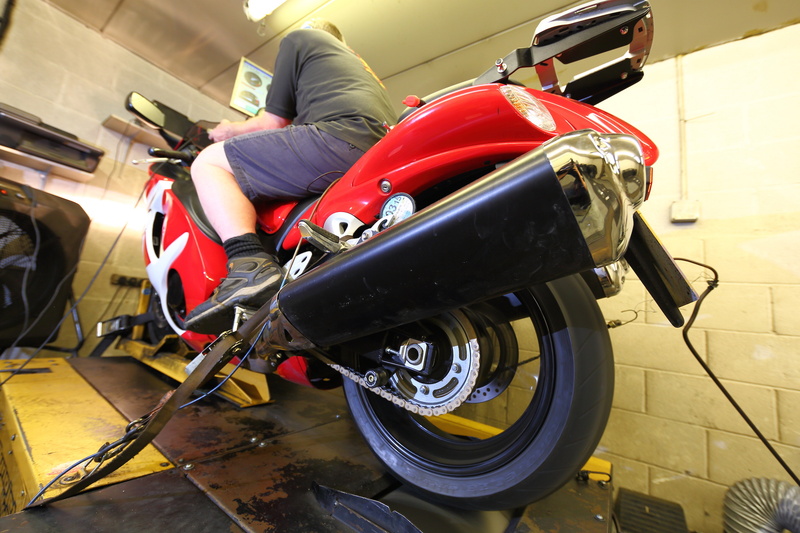 We’ve tried out a few exhaust systems on our long-term Suzuki Hayabusa test bike, so we thought we’d do a bit of a summary of how they performed. 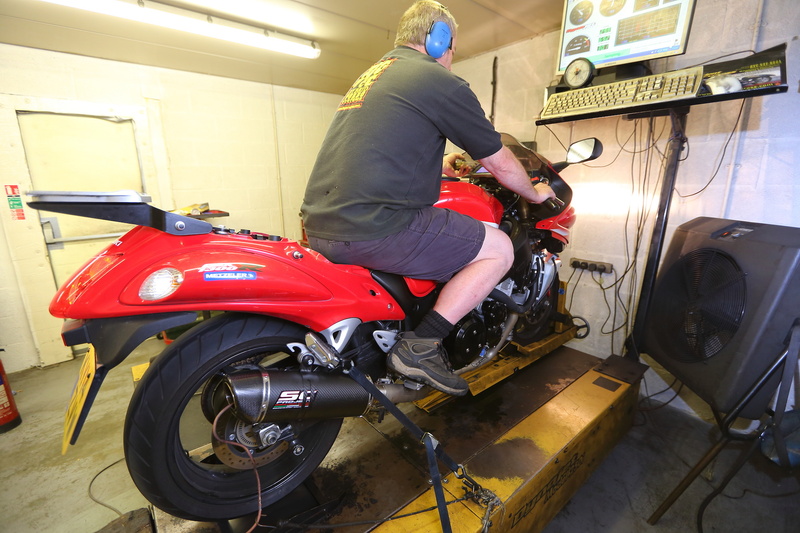 We used the Dynojet dynamometer at Big CC Racing in Wokingham to get a base run on the bike, and then tested the peak power after fitting a set of GPR end cans, an SC Project 4-into-1 full system, and a Yoshimura TRC stainless 4-into-1 full system. We also had a K&N race air filter and a Dynojet Power Commander V fitted to the bike with the pipes, and a quick remap done with each pipe once fitted. It’s important to get a baseline for any comparisons, so once the Hayabusa was run in properly, we took her to Big CC for a stock run. The dyno there is quite a ‘mean’ one – which is to say it generally reads a little low compared with other dynos. But since we’re interested in comparisons, that’s not a problem really. 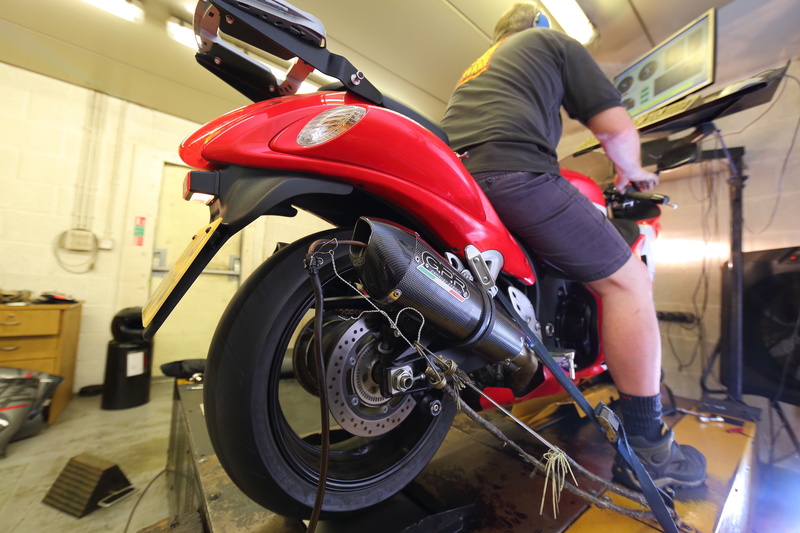 So – peak power at Big CC on our bike was 167bhp, and peak torque was 94.8 ft-lbs. Now we could go and play with some other pipes! Our first test was on a pair of GPR end cans. These Furore cans are made of stainless and aluminium, and they weigh just 2.7kg each – compared with the stock cans at 7.1kg each, erk! So we saved almost nine kilos in about ten minutes just by unbolting the old cans. Next up was our first full system, from the guys at SC Project in Italy. You’ve probably seen their pipes on the MotoGP grid, where they’ve made a big impact in Moto2, MotoGP and Moto3, supporting riders like Scott Redding, Stefan Bradl and Nicky Hayden. So they know what’s what in exhausts. And that shows in the full system they sent us. Beautiful welds, a sweet carbon end can, and super light weight – just over 7kg in total – compare that with nearly 21kg for the full standard exhaust system of headers and twin cans. A couple of hours labour saw the SC system on, saving us 14kg in mass! Finally, we tried out a Yoshimura America full system. Yosh and Suzuki go together like vodka and Red Bull, so we expected great things. And the Yosh sure looked pretty when we got her out of the box! Gorgeous, deep-polished stainless headers, and a sweet carbon end can. Like the SC system, it was far lighter than stock, tipping the scales at 7kg-ish, similar to the SC pipe. 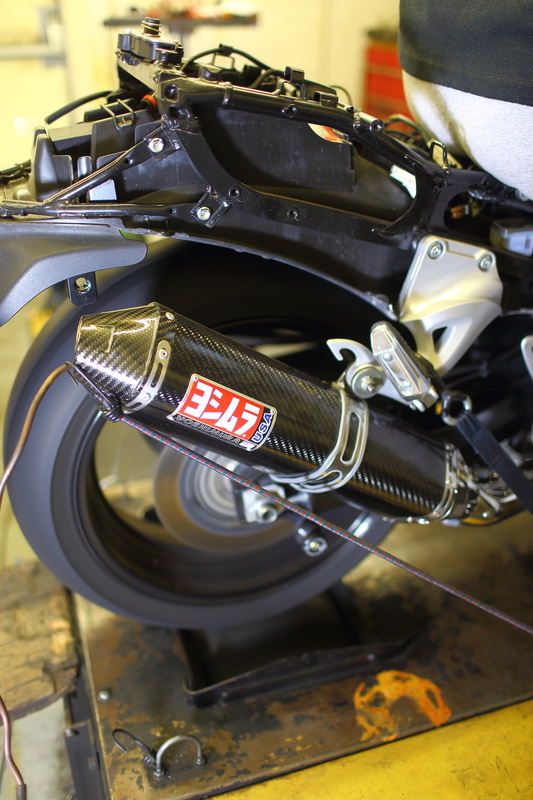 This system is designed for the Gen 2 Busa though, so it fitted perfectly all round. On the dyno, the Yosh did almost as well as the SC, with a 9.2bhp peak power increase, and 20-odd bhp more in the midrange. The Yoshi pipe is far quieter than the SC system though, and even without its optional dB killer, is much more livable-with.